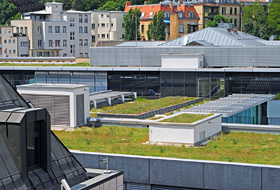 Plant community “Urban Climate Roof” was developed as part of a research project at the Deutsche Bundesstiftung Umwelt and in conjunction with the University of Weihenstephan-Triesdorf. The combination of irrigation, Aquafleece and substrate ensures that there is always sufficient water available for the plants to achieve their high evaporation capacity. The system build-up “Urban Climate Roof” provides for increased cooling of the ambient temperature particularly in urban centres. ZinCo, the innovative green roof manufacturer has developed the “Urban Climate Roof”, a new system build-up and pioneering solution to counteract the heating up of densely populated towns and cities. The “Urban Climate Roof” boasts an extremely high evaporation capacity due to its design with irrigation and special plants and, therefore, provides for the active cooling of the ambient temperature. This allows for existing roof areas to be used directly as additional green areas and to have a positive impact on the urban climate. Increased soil sealing and climate change have the effect of heating up inner cities far more than the surrounding areas through thermal radiation and the resulting urban heat islands have a negative effect on the well-being of people. This is referred to as the “Urban Heat Island Effect”. The innovative system build-up “Urban Climate Roof” is designed for maximum evaporation which can contribute actively to urban climate control, particularly during hot, dry periods. This very high evaporation capacity is achieved by means of a specially developed plant community in conjunction with a needs-based irrigation system that works perfectly with grey water. This was the decisive factor in the development of the plant community carried out as part of a research project at the Deutsche Bundesstiftung Umwelt (German Federal Foundation for the Environment) in conjunction with the University of Weihenstephan-Triesdorf. Selected Euphorbia and Hemerocallis species (Spurges and Day Lillies) proved to be particularly suitable and are now an integral part of the plant list, in addition to Carex buchananii (Leatherleaf Sedge). 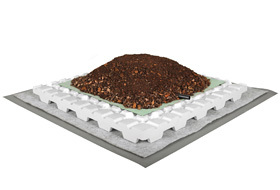 The core element of the system build-up “Urban Climate Roof” is the new Aquafleece AF 300 in conjunction with, for example, Floraset® FS50. Driplines are attached with Velcro strips to the Aquafleece AF 300 every 50 cm. If there is no rainfall, irrigation will take place using an automated system. The water from the driplines is distributed first of all across the entire area through the double-layer build-up of the Aquafleece AF 300. The underside of the thick fabric of the Aquafleece only lets the water drip through if the upper side of the fleece is totally saturated. The pulsating, that is to say, the brief irrigation at short intervals means that water is continuously available. It reaches the overlying substrate through the capillaries and is actively evaporated by the plants. Therefore, they can fully exploit their high evaporation capacity, particularly during dry periods. A mature, well-irrigated urban tree, for example, has an evaporation capacity of up to 300–500 l on a hot summer’s day. 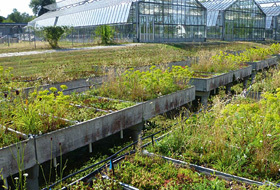 A 100 m² conventional extensive green roof, with a good water supply is generally about the same; during very long dry periods the plants, generally sedum types, switch to a type of “survival mode” and the evaporation rate reduces to about a tenth. With the system build-up “Urban Climate Roof”, the evaporation rate increases to about 700–1000 l/day and 100 m² and remains constant even in dry periods. This occurs after an extremely short period of time. In addition to the location where it can be planted, a newly planted tree requires many years until it has reached maturity. A green roof, however, achieves full coverage after one, or at the most, two vegetation periods and with that, its maximum evaporation capacity. The following recommended values are of interest when categorising the levels of evaporation capacity: the quantity of 300 l/day is sufficient to cool the air volume of a 100 m × 100 m × 100 m cube by about 3–5 °C, depending on the existing humidity. The perceived cooling effect in individual street gorges is, of course, impacted by factors such as the height of a building, its position in the topography, prevailing wind direction and speeds, etc. Generally speaking, increased evaporation will always ensure greater cooling capacity in urban centres. The system build-up for the Urban Climate Roof is suitable for use on all roofs with a pitch of between 0° and 5° and on inverted roofs. This means that existing roof areas can also be used within a short space of time to improve the urban climate.